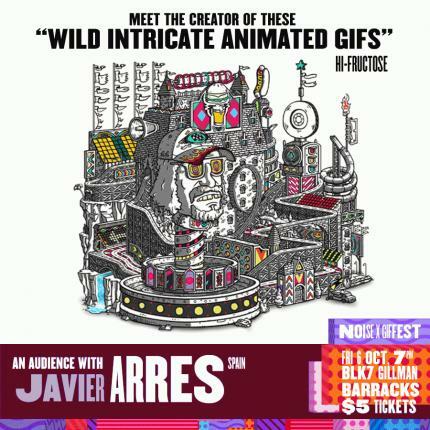 Our guest illustrator and graphic designer is a Madrid based artist who crafts animated GIFs that depict hyper-detailed fantastical worlds and machines. Whether it’s a wild coffee-maker or a wonderful sneaker factory, these amazing “visual toys” require dozens of loops to fully comprehend. The artist’s traditional ink illustrations are also completely mind-blowing due to the level of detail and hidden surprises buried inside his work. In this exclusive session, the artist will share his creative journey as a professional artist, how his signature style was born, and he’ll blow you away with a live GIF making demonstration. Javier started painting with oil and watercolours when he was just ten years old. Years later, as an art student at university, his fascination with videogames and movies was born. He felt his studies were too restrictive, so decided to leave university to study graphic design and digital art at the prestigious ‘Escuela De Arte’ in Granada, Spain. Citing that as one of his best decisions, Javier has gone on to become a full-artist, receiving widespread praise and awards for this work. The creator of ‘visual toys’ draws inspiration from ‘weird fruit juicers’ and TV documentaries, to create his signature intricate GIFs and illustrations. Tickets are limited RSVP before it's too late.